God announces the truth. So follow the religion of Abraham, inclining toward truth; and he was not of those who associate relative with the Absolute. 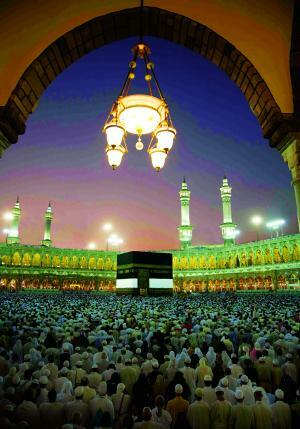 Indeed, the first House [of worship] established for humanity was that at Mecca - blessed and a guidance for the worlds. In it are clear Signs [such as] the standing place of Abraham. And whoever enters it shall be safe. And [due] to God from the people is a pilgrimage to the House - for whoever is able to find thereto a way. But whoever disbelieves - then indeed, God is free from need of the worlds. And, when We designated for Abraham the sacred site of the House, [saying], "Do not associate anything with Me and purify My House for those who circumambulate it and those who stand [in prayer] and those who bow and prostrate. And proclaim to the people the Hajj [pilgrimage]; they will come to you on foot and on every lean camel; they will come from every distant pass - that they may witness benefits for themselves and mention the name of Allah on known days over what He has provided for them of [sacrificial] animals. So eat of them and feed the less fortunate and poor. Every Muslim, whether in the East or the West wishes to be part of this great phenomenon called Hajj or Holy Pilgrimage, and to be from amongst those who are present, and that they may reach this place. There are people for whom this is made easy, while there are others who are not able to go. However God has strentched out His hand of generosity to His creation in every place, and for this reason, he has made hajj incumbent only upon those who are able to go. And for the ones who is not able to go, has God closed him off from all of this? No. The Chosen One, peace and blessings be upon him has told us that whoever sits after the Fajr prayer remembering God, until after the sun has risen, and then prays two rakats of prayer, has the reward for a complete Hajj and umrah! 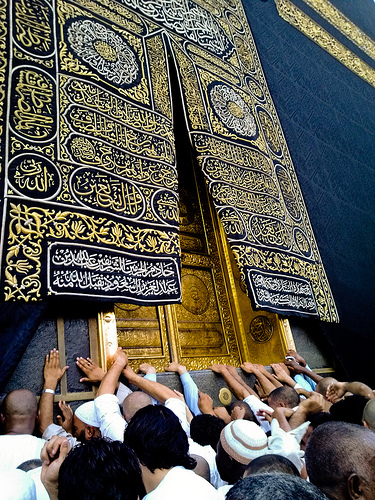 The Prophet, peace and blessings be upon him, also told us in his supplication "O God, forgive the pilgrim performing Hajj, and the one for whom he seeks forgiveness." "In Medina there are people, and we do not cross a valley or a ravine except that they are with us. There are prevented from going for a reason and not because they didn't want to go. However their hearts were present, even though they are not present in their bodies with us." The truth of this reality was such that when the gifts were divided, some of them who were in Mecca were reserved a share, for their sincerity in wanting to be present even though they were not there in their bodies. With their strong intention of the heart, their presence was accepted. And Hajj is also like that. If somebody feels on the Day of Arafat that they are with the people of Arafat And it has been the practice of many Muslims in different countries across the world on the day of Arafat to be as if they are at Arafat. This gathering is known as the gathering of ta'rif. Today, Saturday, the pilgrims will gather in the sacred valley of Arafat. If you have an opportunity, you may watch them live via Youtube Live feed and with your heart be with them. May those who couldn't be present at the holy site with their body, be present with their hearts and may they also receive the share of blessings as the guests at the House of God receive in abundance. And God is the Most Generous. Grant me to see Bait'uLlah.